Alex Tabarrok (reference below, video on right) notes that Communism can be thought of as a system of universal price controls. He notes that each of the shortcomings examined in Price Ceilings and Price Floors were the norm – everyday occurrences – in command economies. At http://www.mruniversity.com/node/201800?utm_source=PrinciplesAnnot&utm_medium=PQAnnot&utm_campaign=MRUYTAnnotation, accessed 1 May 2016. On average, should we expect better customer service from a capitalist or a Communist employee? The Price System and Price Regulation (core topic) in Economic Analysis and Atlas102 Economic Analysis. 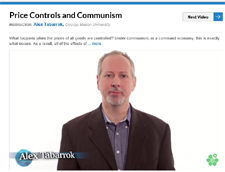 Alex Tabarrok, Price Controls and Communism (4-minute video), Principles of Economics – Microeconomics, Marginal Revolution University, at http://www.mruniversity.com/courses/principles-economics-microeconomics/government-price-control-definition-rent-control-minimum-wage, accessed 1 May 2016. Page created by: Ian Clark, last modified 1 May 2016. 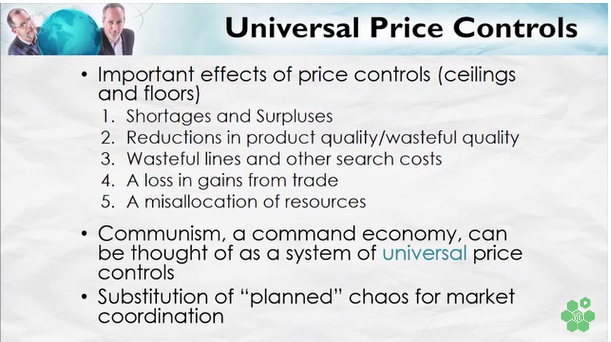 Image: Alex Tabarrok, Minute 0:13 of Price Controls and Communism (4-minute video), Principles of Economics – Microeconomics, Marginal Revolution University, at http://www.mruniversity.com/courses/principles-economics-microeconomics/government-price-control-definition-rent-control-minimum-wage, accessed 1 May 2016.